4 New Heroes with matching character cards, and 6 new Global Effects cards to add to the Darkness Spreads deck - creating more challenges for the players to face. In the 2nd hero expansion set, there are 4 new heroes, and a bunch of global effect cards. The 4 new heroes are: The elf lord, the monk, the druid, and the healer. This expansion contains some of the most thematic characters in this game. The Elf lord, is a very powerful character. He has a re-roll token that enables the player to re-roll any failed die once per turn. And he can also throw one additional die upon his first attack. Finally, he has another handy ability where it doesn’t cost him action tokens to move into a green location as long as his action tokens are not fully spent. This means, in the north east area of the board where there are lots of green locations (the area where the dragon and the orc general are), the elf lord is an absolute killing machine as he can travel to many locations and killing many minions in his turn. The Monk, is my favorite character in this expansion. She starts the game with 2 quests, this means she has a higher chance of getting good items very quickly. She also has some very interesting offensive ability, if a combat, if she throws a natural 6, it counts as 2 hits (although it does’t work against dragonkins). And when she takes damage (from loosing a battle against a general or minions), she can throw die and take use any die that are great than 5 to parry the damage taken. The druid, is a very thematic character. He sounds pretty weak in description, but he is actually very powerful in the game. His main abilities are mainly tied to green locations on the board. But he has a special ability that allows him to attack minions anywhere on the map in green locations at -1 to die rolls. This means if Druid is in play, it is very easy to prevent orc minions from spreading across the map. Finally the healer, she can provide healing to other players, but I do not find her to be particularly useful except in general combat. The healer can ignore the general’s special abilities (except the dragon general). This a very neat skill to have in battles against generals. 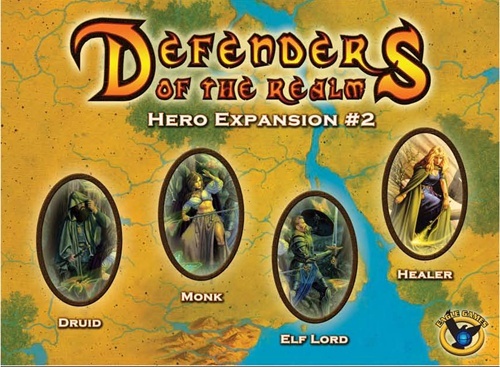 Overall, this expansion has some very good characters, and it is a worthy addition to Defenders of the Realm board game. Add a Review for "Defenders of the Realm: Hero Expansion #2"